In July 2010, the final of 312 Unit Support Tankers (UST) left Fluid Transfer for the MAN storage facility at Ashchurch, Gloucestershire. 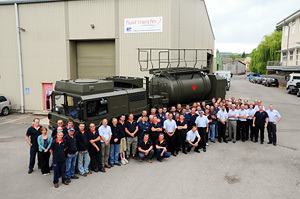 The competition of this contract, which was awarded to Fluid Transfer by MAN Truck and Bus UK in March 2005, marks the culmination of 5 years of intense activity. We thus provided the UK MoD with a new generation tanker, designed to be deploy the front line of the battlefield providing essential fuel supplies to vehicles and equipment. The contract called for 4 variants of the vehicle based on the MAN HX58 SX44 chassis and included winterised and waterproof variants capable of operating at temperatures ranging from -40º C to 50º, deployable from amphibious craft landing directly onto the beach head. The first prototype vehicle was delivered to MAN in March 2006 and the production vehicle left the factory in 2007. UST’s are now in use by the UK armed forces around the world including Afghanistan and are exceeding the expected levels of reliability. The success of this contract was only possible with the establishment of a dedicated design and production facility within the Nailsworth factory. We at Fluid Transfer International are immensely proud of our achievements. We delivered the UST on time, within budget and are committed to supporting the vehicle over its 20 year life span. The day was marked with a photo opportunity in front of the last vehicle; the celebration was then followed by a pig roast and barbecue.